Glass Shade has an intricate swirl and dot pattern interlocking around the piece and has concentric circles on its base. The piece is clear glass and is in great condition without any chips, cracks or hairlines. Measurements are approximately 5" in height, in 4 1/2" in width, with its mouth's outside edge being 3 1/4" in width. Add a touch of interest to any light fixture or use it as an adorable jar–the possibilities are endless! 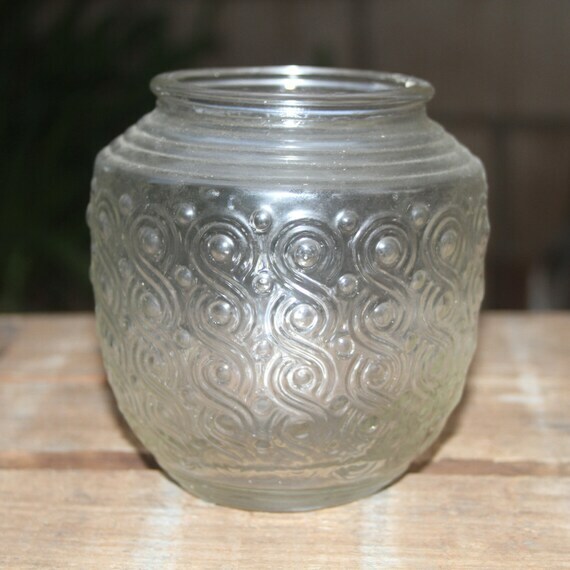 This entry was posted in http://feedproxy.google.com/~r/JujubefunnyFinds/~3/5RmOxZr1KCM/embossed-glass-light-shade-candle1384777627 and tagged IFTTT. Bookmark the permalink.